Gazelli Art House is delighted to announce Endec, filmmaker and interdisciplinary artist Ben Tricklebank’s first solo exhibition in the UK. 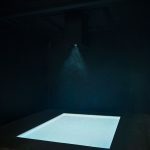 Following Tricklebank’s recent collaboration Light Echoes at the Barbican*-, Endec will debut a site-specific installation and series of photographs that explore notions of control and freedom through our relationship with technology. 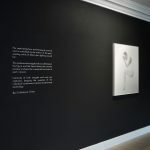 In his latest installation set within the gallery’s ground floor, themes of reaction and distortion are addressed through his audience’s interaction with a bright, white reflecting pool. 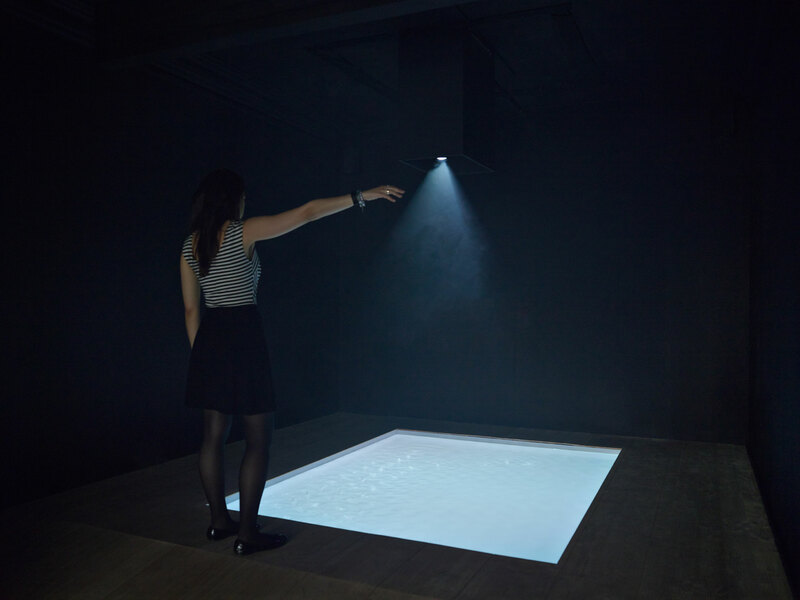 Filled with opaque milky substance, the pool serves as a liquid canvas, which both responds to and is manipulated by the viewer. 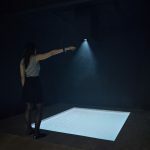 Using a combination of projection and sensors that analyse motion, the piece is activated by the audience’s varying levels of action and inaction. 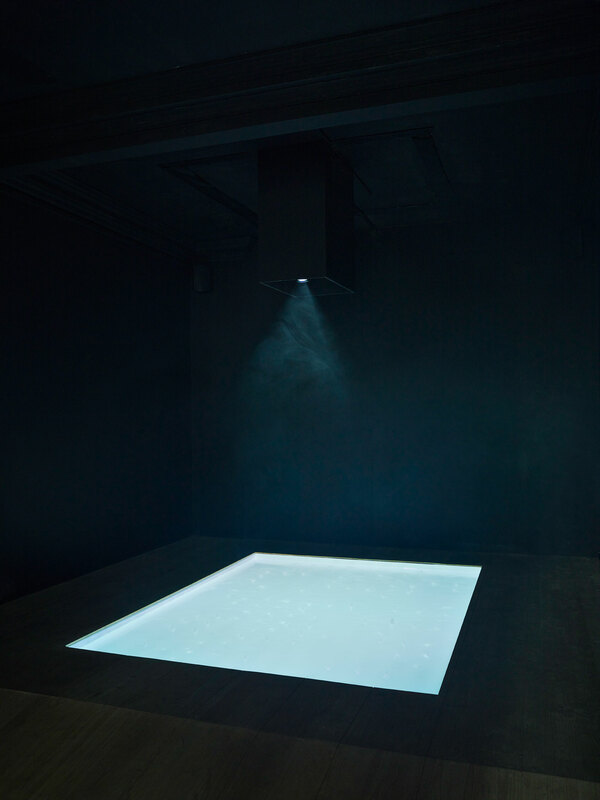 The ripples intensify as the viewer nears the installation simultaneously repelling points of light to reveal a silhouette below this viscous plane. Creating a visual interplay between surface and motion, intimate moments of reflection and influence are realised through the undulating patterns in this innately infinite and abstract canvas. 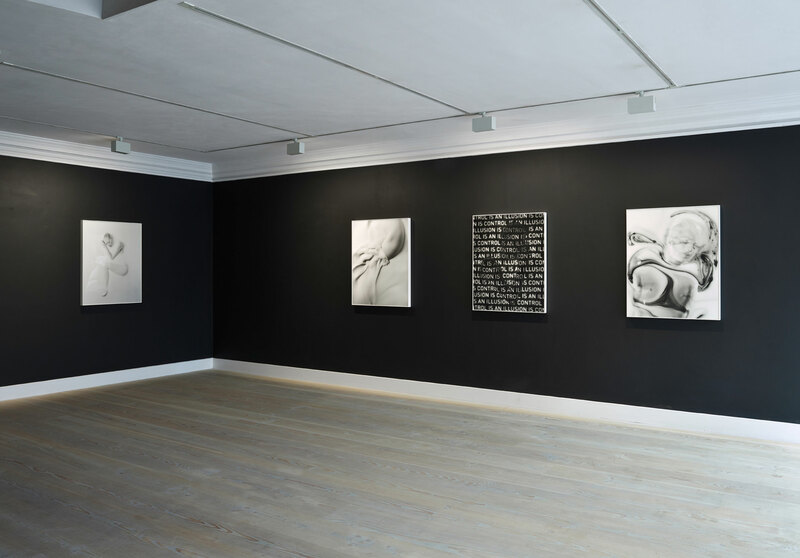 Adjacent to and forming a visual dialogue with the installation is a new series of photographic prints featuring a female figure partially submerged, yet fully coated in a marbled, milky-white fluid. Swirls of black dye ripple around her and her beautifully captivating form simultaneously controls and is controlled by the motion of the pool. This symbiosis of struggle and accord between the figure and the liquid allows the creative process to shape the unexpected outcome of each ‘canvas’. 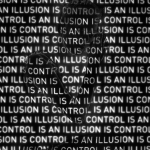 Overlaid text on one image highlights this contemporary, sociotechnical conundrum whereby control is an illusion, and illusion is control. Instances of both struggle and unison are captured, begging the elevated question of the individual’s autonomy in relation to advancing technology. 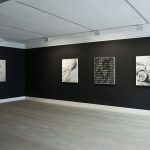 Endec marks the first instalment of a two-part exhibition with an eponymously titled short film deriving inspiration from the installation and photographic series to follow. 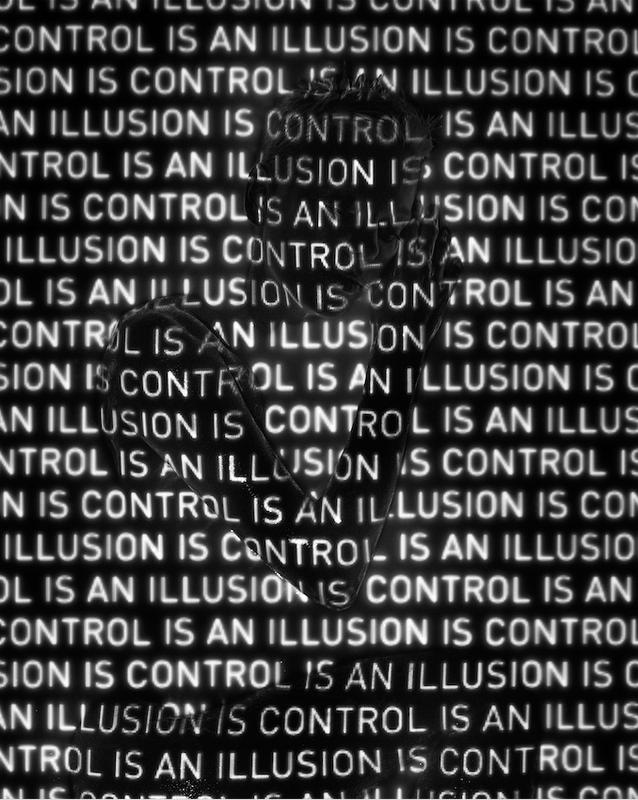 Alongside Tricklebank’s solo exhibition, concepts of control, surveillance and security will be examined in a group show featuring artists working with VR (virtual reality) technology in their practice. 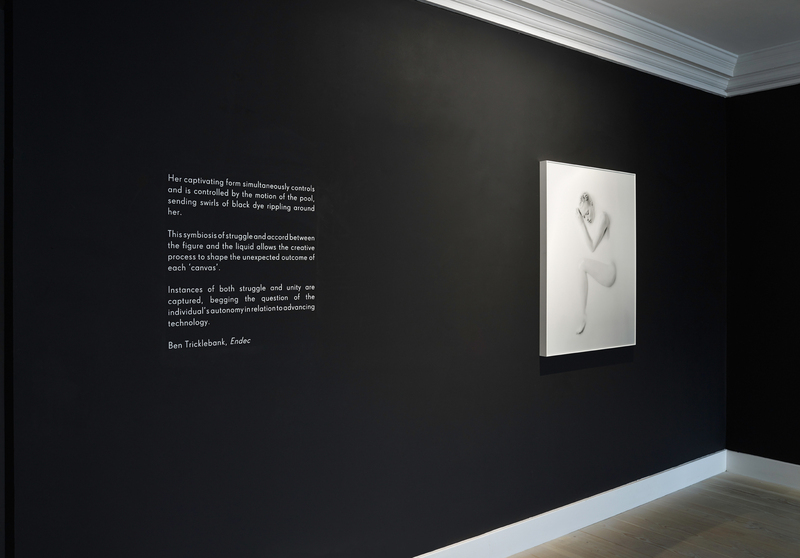 Displayed on the first floor, this show within a show will introduce the new medium for the first time within the gallery’s context, surveying ways in which the Summer 2016 release of Oculus Rift might influence trends, commercial and institutional engagement and artists working in this field. A full list of artists as well as contributing partners will be announced shortly.